KOTTAYAM. JUN.18: An interactive workshop on ‘Dengue Epidemic management’ was held at Central Research Institute (CRI) (H) Kottayam. Dr. Raj Kumar Manchanda, Director General, CCRH has inaugurated the workshop. 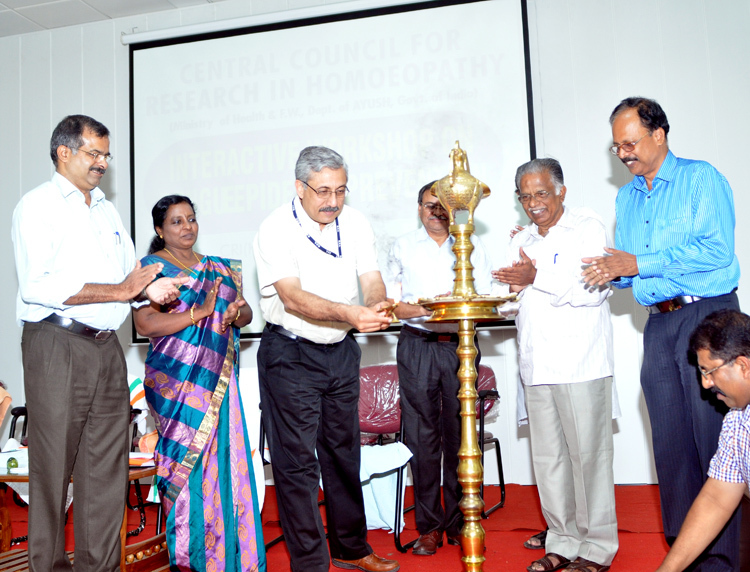 Dr. Ravi M. Nair, former Advisor (Homoeopathy) to the Government of India, Dr. Manilal, Member, CCH, Dr. Hemakumari, Deputy Director, Department of Homoeopathy, Government of Kerala and Dr. Surender Verma, Deputy Director, Department of AYUSH, Delhi Government, officers of CRI Kottayam, nodal officers from the Council; Dr. P.S. Chakraborty, DACRRI(H), Kolkata, Dr. R.V. Bawaskar, RRI(H), Navi Mumbai & Dr. Divya Taneja, Research Officer (H),Council headquarters and nodal officers of Rapid Action for Control of epidemics through homoeopathy (RAECH), district medical officers or their representatives from various districts of Kerala and academicians from homoeopathic medical colleges was present on the ocassion. This was an interactive workshop to discuss strategy for prevention of epidemics, with specific reference to dengue epidemic. The ‘Guidelines for homeopathic practitioners for clinical management of dengue fever’ was released during the workshop. Dr. K.R. Janardanan Nair, Officer In-charge CRI (H), Kottayam welcomed the gathering. Dr. Hemakumari addressed the audience and explained the epidemic control activities taken up by Government of Kerala. Dr. Ravi M. Nair detailed about the activities under RAECH program. He suggested the necessity of revamping the activities considering the regular epidemics occurring in the state to avoid any procedural delay and flaws. Dr. Manilal expressed confidence in capability of RAECH to contain any epidemic outbreaks in Kerala. Dr. R. K. Manchanda, in his inaugural address expressed his happiness in the epidemic control programmes undertaken by Government of Kerala and that CCRH is keen on the outcome obtained from the state in controlling the epidemic outbreaks. He suggested that the system should work on standardized guidelines and effective interaction is required for reviewing the activities, on the pattern of countries like Cuba and Brazil. The inaugural function ended with vote of thanks delivered by Dr. B. Indira, Assistant Director (H), CRI (H), Kottayam. In the Scientific Session, Dr. R. Rajasekharan, CMO, Department of Homoeopathy, Kerala & Member, High Power Committee, RAECH made a presentation on the modus operandi of RAECH. The district medical officers presented specific data of epidemics such as dengue, chikungunya, epidemic fevers, conjunctivitis, leptospirosis, and other epidemic conditions in respective districts in the past three years. Dr. Manchanda presented the strategy on different epidemics being developed by the Council. He opined that for control and prevention of epidemic diseases, there should be a joint effort of the Council and homoeopathic practitioners. He highlighted the importance of clinical data available with practitioners in the field, which is important for developing an evidence base for homoeopathy. Strategies for collating activities of RAECH and CCRH for epidemic management in Kerala were discussed.